Dufty provides a boys (and girls) own adventure account of Australian signals intelligence in the WW2 Pacific War. The book makes the case for Australia's contribution to Macarthur's fight from Australia back to the Philippines, the role of academics and civilians in this effort and of women, against bureaucratic obstacles. The book is packed with anecdotes, as well as history. 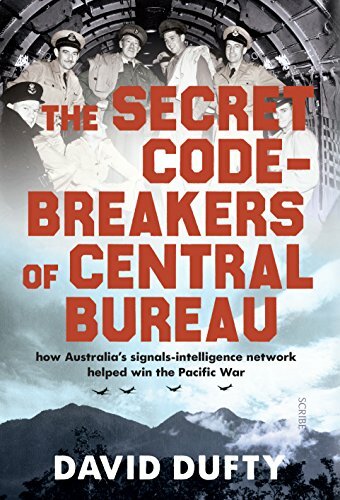 With modern day concerts over cyber-security and its likely part in future wars in our region, it is useful to be reminded where the Australian Signals Directorate (ASD) came from and their difficult relationship with government, the military establishment and Australia's allies. On ABC Radio Canberra Thursday morning there was a segment on high charges for communal hot water systems in Canberra. In 2013 I asked for an ACT Assembly Inquiry into Energy Billing, as the charges were five to ten times what they should be. However, no action was taken by the ACT Assembly. If the ACT Assembly will not stop incumbent energy retailers from imposing unconscionable charges, then perhaps new local businesses need to "disrupt" the business model. New providers could assist the body corporate of a block of units to purchase energy in bulk and meter it to each unit, using billing as a service in the cloud. The ACT Government, along with Canberra's universities, have fostered a start-up community to help set up new businesses using new technology. This includes Canberra Innovation Network and the Renewables Innovation Hub. I have been mentoring start-ups through the Innovation ACT competition and setting up an energy metering business is no more complex than some new businesses I have helped with. ps: I teach "ICT Sustainability" at the ANU, on how to estimate and reduce carbon emissions using computers, through such measures as computerized metering.